In 1938 Trudi Kanter, stunningly beautiful, chic and charismatic, was a hat designer for the best-dressed women in Vienna. She frequented the most elegant cafés. She had suitors. She flew to Paris to see the latest fashions. And she fell deeply in love with Walter Ehrlich, a charming and romantic businessman. But as Hitler’s tanks rolled into Austria, the world this young Jewish couple knew collapsed, leaving them desperate to escape. Sifting through a secondhand bookshop in London, an English editor stumbled upon this extraordinary book, and now, though she died in 1992, the world has a second chance to discover Trudi Kanter’s enchanting story. In these pages she is alive—vivid, tenacious and absolutely unforgettable. This reading group guide for Some Girls, Some Hats and Hitler: A True Love Story includes an introduction, discussion questions, and ideas for enhancing your book club. The suggested questions are intended to help your reading group find new and interesting angles and topics for your discussion. We hope that these ideas will enrich your conversation and increase your enjoyment of the book. In London, in 1984, Trudi Kanter's remarkable memoir was published by N. Spearman. Largely unread, it went out of print until it was re-discovered by a British editor in 2011 and now, for the first time, it is available to readers everywhere. In 1938 Trudi Miller, stunningly beautiful, chic, and charismatic, was a hat designer for the best-dressed women in Vienna. She frequented cafes. She had suitors. She flew to Paris to see the latest fashions. And she fell deeply in love with Walter Ehrlich, a charming and romantic businessman. But as Hitler’s tanks roll into Austria, the world this young Jewish couple knows and loves collapses leaving them desperate to find a way to survive. 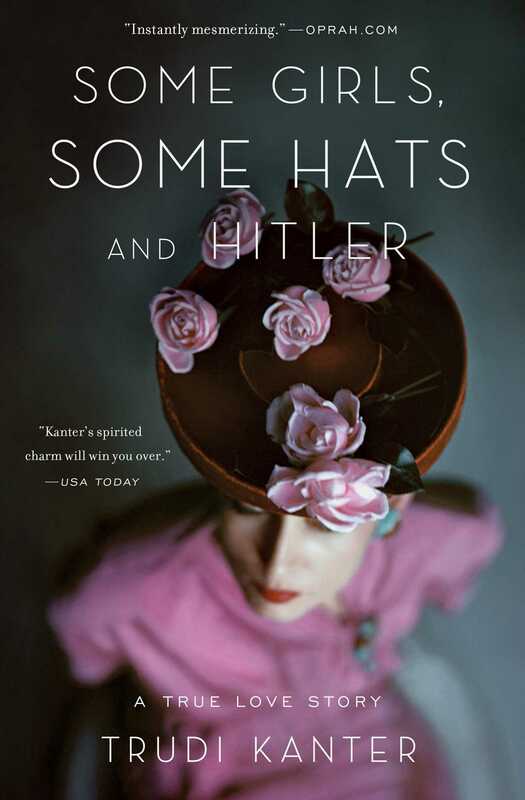 Some Girls, Some Hats and Hitler is an enchanting true story that moves from Vienna to Prague to blitzed London, as Trudi seeks safety for her and Walter amid the horror engulfing Europe. In prose that cuts straight to the bone, Trudi Kanter has shared her indelible story. Some Girls, Some Hats and Hitler is destined to become a World War II classic. 1. The subtitle of this memoir is “A True Love Story Rediscovered.” How much of Kanter’s tale is a love story, and how much a war story? How did the experience of war bring Trudi and Walter closer together? 2. When Trudi tried to convince Walter to flee Vienna in 1938, he responded, “You know that you always put your head down and charge at the wall, whereas I need to think carefully before I make a decision.” (p. 35) How did the differences in Trudi and Walter’s decision-making effect their chances of survival? 3. Describing the anti-Semitic mobs in 1938 Vienna, Trudi wrote, “This is the truth about what happened, but I feel some reluctance to write it down.” (pp. 44-45) Why did Trudi hesitate to describe the realities of Nazi Vienna? Do you think she portrayed the people of Vienna fairly? Why or why not? 4. Consider the role that jealousy played in Trudi and Walter’s relationship. When did Trudi worry about losing Walter to other women? Did her fears seem justified? Why or why not? 5. Discuss Trudi’s relationship with her ex-husband, Pepi. How did they manage to remain close after the end of their marriage? In what ways did Trudi have trouble letting Pepi go? 6. Consider the gender roles in Trudi and Walter’s relationship. How did Walter handle Trudi’s success as a designer? How did Trudi deal with Walter’s slow career start in London? In what ways were Trudi and Walter ahead of their time, in terms of gender and the workplace? 7. During their first weeks in London, Trudi observed in frustration, “No one will let us forget that we are foreigners!... It’s a dirty word!” (p. 153) Discuss how Trudi and Walter were treated in London. What kinds of discrimination did they face? 8. Trudi wrote, “Now that I am married to Walter, I have come to realize that there can’t be red roses every day. A good marriage means having someone to talk to at night, someone you can fight with and fuss over. Someone you can trust.” (pp. 192-193) Discuss Trudi and Walter’s transition from daily roses to everyday trust. What did Trudi gain and lose when she married Walter? 9. When Trudi fought off Mr. Curlow’s romantic advances, she discovered, “Even in my smart clothes, with my sophisticated maquillage, my two marriages and all my recent experiences, I am still an immature girl.” (p. 222) Did you think of Trudi as an “immature girl” or an experienced woman when you read her memoir? Explain your answer. 10. Discuss how the War affected Trudi’s relationship with her parents. 11. Consider the ups and downs of Trudi’s career as a hat designer. How did she manage to advance in her career, even as a new immigrant to London? Which of her designs sounded the most innovative? 12. “There was a time when a feather and a sequin was a hat.” (p. 24) Discuss the changing hat fashions during the years Trudi described in her memoir. Which fashions sounded the most alluring? Which could you picture women wearing today? 13. When Mr. Curlow’s factory was bombed, he said to his workers, “We’ll build it all up again, everything as it was… Brick by brick, floors and ceilings, water and electricity. All of it! Who is with me?” (p. 224) How did Walter react to Mr. Curlow’s determination to rebuild? How did Mr. Curlow’s statement capture the spirit of wartime England? 14. The end of the memoir briefly describes the end of Walter’s life. What was particularly tragic about Walter’s death in 1960? Do you think this memoir of love and war was difficult for Trudi to write? Why or why not? 15. Some Girls, Some Hats and Hitler was originally published in England in 1984, but went largely unread. Why do you think today’s readers might be especially interested in Trudi’s story? How are her struggles and adventures relevant to readers today? 1. Ask members of your book club to wear their favorite hats to your meeting! From retro cloches to modern sun hats, compare your favorite pieces of stylish and practical headwear. 2. Browse an online exhibit of wartime Vienna – including photographs, personal histories, artifacts, and maps – at the United States Holocaust Memorial Museum’s website: http://www.ushmm.org/wlc/en/article.php?ModuleId=10005452. 3. Read all about the history of women’s hat fashions, from the 18th century through the 20th century: http://vintagefashionguild.org/fashion-history/the-history-of-womens-hats/. 4. Treat your book club to a taste of Vienna! Bake a batch of decadent Sachertorte, a traditional café dessert, and serve it at your book club meeting. Find a recipe here: http://www.epicurious.com/recipes/food/views/Sachertorte-231043. 5. “Walter and I used to play a game,” Trudi writes – they would quiz each other on the contents of Walter’s long-lost home in Vienna. (p. 51) Pair off in your book club and ask your partner to remember details of her first childhood home. What color were the bedroom curtains; how many lamps were in the living room; what did the kitchen cabinets look like? Trudi Kanter was born in Austria and moved across Europe as she tried to escape the Nazis. She and her husband finally settled in England, where she first published her memoir. Her story was lost after her death in 1992 but was reintroduced to the world with the publication of Some Girls, Some Hats and Hitler. "A fascinating romance, a tribute to the love that beat Hitler."